Italian painter and architect, whose main distinction, however, rests on his valuable history of Italian art, was born at Arezzo on the 30th of July 1511. At a very early age he became a pupil of Guglielmo da Marsiglia, a very skilful painter of stained glass, to whom he was recommended by his own kinsman, the painter Luca Signorelli. At the age of sixteen he went to Florence, where he studied under Michelangelo and Andrea del Sarto, aided by the patronage of the Medici princes. In 1529 he visited Rome and studied the works of Raphael and others of his school. The paintings of Vasari were much admired by the rapidly degenerating taste of the 16th century; but they possess the smallest amount of merit, being in the main feeble parodies of the powerful works of Michelangelo. Vasari was largely employed in Florence, Rome, Naples, Arezzo and other places. Many of his pictures still exist, the most important being the wall and ceiling paintings in the great hall of the Palazzo Vecchio in Florence, and his frescoes on the cupola of the cathedral, which, however, were not completed at the time of his death. As an architect he was perhaps more successful: the loggia of the Uffizi by the Arno, and the long passage connecting it with the Pitti Palace, are his chief works. Unhappily he did much to injure the fine medieval churches of S. Maria Novella and Santa Croce, from both of which he removed the original rood-screen and loft, and remodelled the retro-choir in the degraded taste of his time. Vasari enjoyed a very high repute during his lifetime and amassed a considerable fortune. He built himself in 1547 a fine house in Arezzo, and spent much labor in decorating its walls and vaults with paintings. He was elected one of the municipal council or priori of his native town, and finally rose to the supreme office of gonfaloniere. He died at Florence on the 27th of June 1574. 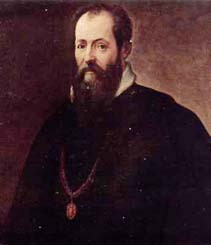 Personally Vasari was a man of upright character, free from vanity, and always ready to appreciate the works of others: in spite of the narrow and meretricious taste of his time, he expresses a warm admiration of the works of such men as Cimabue and Giotto di Bondone, which is very remarkable. As an art historian of his country he must always occupy the highest rank. His great work was first published in 1550, and afterwards partly rewritten and enlarged in 1568, bearing the title Le Vite de' più Eccellenti Architetti, Pittori, et Scultori. It was dedicated to Cosimo de Medici, and was printed at Florence by the Giunti; it is a small quarto illustrated with many good woodcut portraits. This first edition of the complete work is usually bound in three volumes, and also contains a very valuable treatise on the technical methods employed in all branches of the arts, entitled Le Tre Arti del Disegno, cioe Architettura, Pittura, e Scoltura. His biographies are written in a very pleasant style, interspersed with amusing stories. With a few exceptions Vasari's judgment is acute and unbiased. And though modern criticism -- with all the new materials opened up by research -- has done valuable work in upsetting a good many of his traditional accounts and attributions, the result is a tendency very often to underestimate Vasari's accuracy and to multiply hypotheses of a rather speculative character. The work in any case remains a classic, however it may be supplemented by the more critical research of modern days. Vasari gives a sketch of his own biography at the end of his Vite, and adds further details about himself and his family in his lives of Lazzaro Vasari and Francesco Salviati. A good edition of Vasaris works was that published at Florence by Milanesi (1878-82), which embodies the valuable notes in the earlier edition by Le Monnier (1846); another, by Venturi, was begun in 1896. The Lives has been translated into French, German and English.